We all have been there, we wait till the very last minute to shop for gifts. I know I've been there, not always because I love to start shopping early to finish off my list and not have to worry, but if it does happen, here are a few items that always are a good idea for last minute gifts for anyone on your list. People always need nice wine glasses, or a chic water bottle, how about a classic French press coffee maker, or a cool and sleek BBQ tool kit (I mean, who doesn't grill, right? ), but I think the most popular welcomed gifts are candles (I welcome candles anytime), pretty phone covers and on the go chargers (I need one of those, badly). Then there is just pretty little things to just make eyes twinkle and those are dainty but adorable hair accessories. Shop the list below and remember to scroll down to the end to find all the items pictured. What do you think? 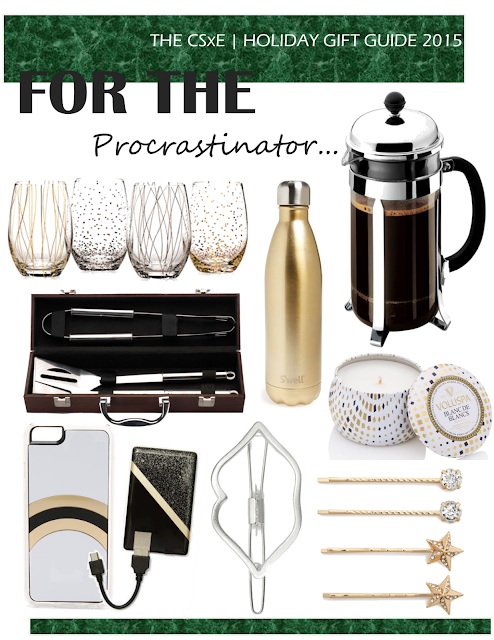 or what do you have on your last minute gift shopping list? Thank you! Thank you! For the super SWEET gift. You welcome lovely! Happy you liked it!